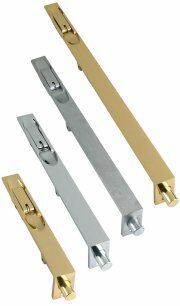 Solid brass surface door bolt, supplied with 3 keeps for various fitting applications. Available in 4 inch (102mm), 6 inch (150mm), 8 inch (202mm) & 10 inch (254mm) length x 35mm width. In Polished Brass, Polished Chrome & Satin Chrome. 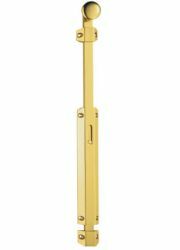 Solid brass, high quality, lever action flush door bolts, available in 150mm, 202mm, 254mm, 305mm, 450mm & 600mm sizes, 20mm width with 11mm diameter shoot bolt. Solid brass, heavy duty, straight barrel bolts, supplied with 3 keeps for various fitting applications. Available in 100mm, 150mm, 200mm, 300mm, 450mm & 600mm on a 38mm backplate, with a 12mm bolt diameter. Or 450mm, 600mm & 900mm on a 50mm backplate, with a 16mm bolt diameter. Antique brass surface door bolt, supplied with 3 keeps for various fitting applications. Available in 4 inch(102mm), 6 inch(150mm) and 8 inch(202mm) length x 35mm width. Solid brass extended surface bolt, 150mm bolt body, with overall length of 355mm, supplied with 3 keeps for various fitting applications. Security rack bolt, operated by splined key or rack bolt thumbturn (sold separately). Avaialable in Electro Brass, Polished Chrome, Satin Chrome & Powder Coated White. Overall length 61mm, backset to key turn 32mm. 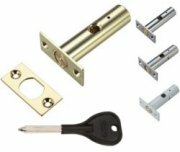 Supplied with key, face plates and fixings. Oval shaped turn to operate security rack dead bolts. Size 32mm x 21mm, back rose 38mm, projection 31mm. Available Polished Brass, Antique Brass, Polished Chrome, Satin Chrome & Satin Nickel. Solid brass sunk slide flush door bolts. Size 102mm x 17mm, 8mm diameter shoot. 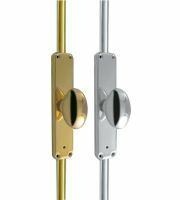 Available in Polished Brass, Satin Chrome, Polished Chrome & Satin Nickel. Stainless steel flush door bolts. 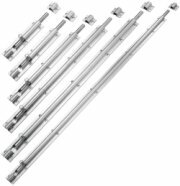 Available in Satin Stainless Steel, in 150mm, 200mm, 305mm, 450mm, 600mm and 914mm x 20mm, with 11mm diameter shoot bolt. 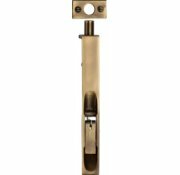 Antique brass lever action flush door bolts, available in 150mm, 202mm and 254mm sizes, 20mm width with 11mm diameter shoot bolt. Solid brass straight barrel bolt in 102mm x 32mm, 152mm x 32mm or 202mm x 32mm. In Polished Brass, Antique Brass, Polished Chrome, Satin Chrome. & Satin Nickel. Solid brass necked barrel bolt in 102mm x 32mm or 152mm x 32mm. In Polished Brass, Antique Brass, Polished Chrome & Satin Chrome. Espagnolette bolt with a 56mm diameter oval knob, set supplied with 2 x 1.5 metre rods, which can be cut down to size. Suitable for doors to a maximum height of 3m. 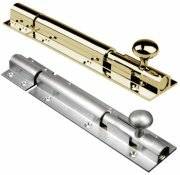 Locking espagnolette bolt, supplied as complete set with all fixings including Euro Cylinder, 2 x 1.5m Bolts which can be cut down to the required length, angle and flat mortice plates, and outside knob set. To suit maximum door height 3000mm. Solid brass architectural surface bolt, supplied with 3 keeps for various applications. Available in 8 inch (202mm), 12 inch (305mm) & 18 inch (457mm) sizes. In Polished Brass & Polished Chrome. 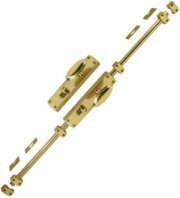 Solid brass dutch door bolt, supplied with 3 keeps for various applications. Available in 8 inch (202mm), 12 inch (305mm) & 18 inch (457mm) sizes. 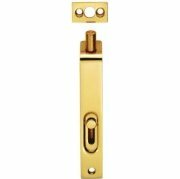 Solid brass bathroom indicator door bolt, size 64mm x 38mm. Ludlow Foundries black iron antique finish straight door bolt. Available in 110mm, 145mm and 195mm sizes. 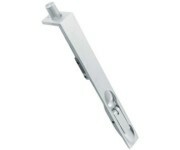 Supplied with staple and plate fixings for face or side fitting. Ludlow Foundries black iron antique finish cranked door bolt. Available in 115mm, 157mm and 214mm sizes. Oil rubbed solid bronze straight door bolt by Louis Fraser. Cast from solid bronze and passed through a series of hand applied chemical processes to help achieve this natural patina, and then finished with a thin coating of beeswax. Available in 5 inch (127mm) or 8 inch (203mm) sizes. From The Anvil pewter patina straight knob door bolts are tight fitting, well made and have a unique spring mechanism. For inward opening doors.